Let your bookmark tell you the meaning of tens of thousands of words. 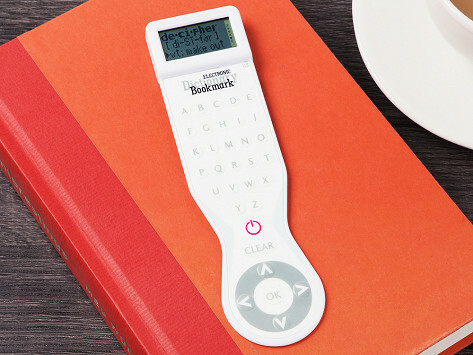 This electronic dictionary bookmark is slim enough to mark your page and smart enough to define 38,000 words. Dimensions: 2.6" x 8.1" x 0.8"
Use all the time. wonderful idea. Bought one as a gift and the recipient was VERY pleased and uses it a frequently. Great gift for grandson in high school. Highly recommended. My grandkids were excited to get this. The keypad though was difficult to use. Some letters didn’t always work the first time pressed. As a dictionary it does help a little, but it doesn't seem to contain a lot of the words I need. I still use it a lot though, and like it.